Andhra Pradesh govt. had re-introduced the AP Adarana 2 Scheme and is inviting online application forms at adarana.ap.gov.in from the artisans of backward class (BC) category. Under the Adarana scheme 2, the state govt. would provide modern tools to artisans with 90% subsidy which was 70% previously and has allocated Rs. 750 crore to it. In Adarana 2 Scheme on purchasing the modern tools and gadgets government of Andhra Pradesh will serve up to 90% Subsidy. Only 10% percent of the total cost has to spend by the BC Community Buyer.Adarana Scheme II is the flagship scheme for backward classes which aims to modernize their tools and technology. AP Adarana 2 Scheme will empower the poor artisans in rural areas by creating additional income, raising their living standards and by increasing their productivity. The Andhra Pradesh Backward Classes Co-operative Finance Corporation is doing the work of implementing Adarana 2 Scheme. The especially poor BC communities who do their survivals through the Cattle and sheep rearing, Toddy tapping, Earth works and Black smithy etc will get the 90% Subsidy on purchasing the modern tools. This scheme will provide financial assistance on tools in 3 slabs i.e Rs. 30,000, Rs. 20,000 and Rs. 10,000/- as unit cost with 70% subsidy component, 20% NBCFDC loan and 10% beneficiary contribution for procurement of model tools and gadgets. will provide 90% Subsidy on modern tool purchase. Beneficiary has to pay only 10% of the total Cost. It will increase the income of the Beneficiary of the scheme. Should be the native of the state. All the BC category applicants must belong to the age group of 18 to 50 years. Beneficiaries shall be registered under Praja Sadhikarika Survey (Smart Pulse Survey). 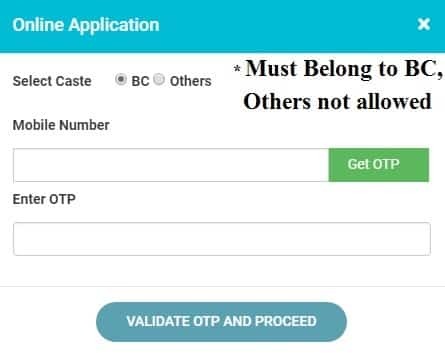 Here candidates needs to fill their ration card number, personal details, aadhaar number and click at the “Submit” button to complete the registration process. In case the applicants of BC category are finding it difficult to understand the application filling process for adarana scheme, then they can click at How to Apply for Adarana Scheme Online to know the process in detail. 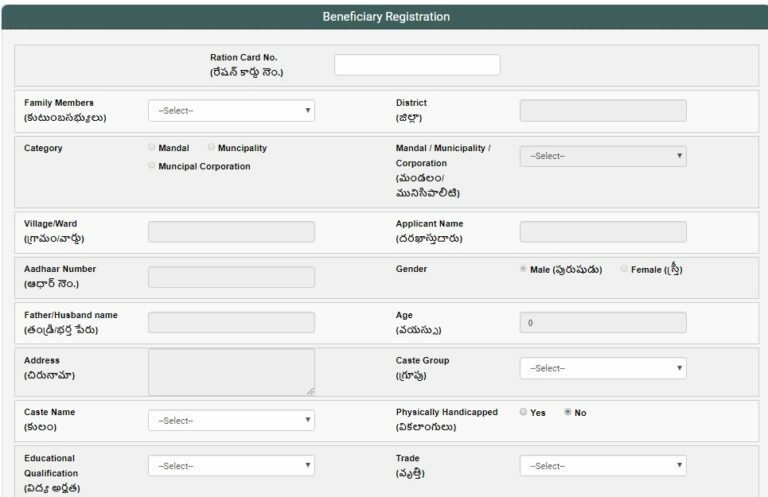 Finally, candidates can enter their ‘Application / Ration Card Number’ and click at the “Get Application details” options to check the online application status of Adarana 2 scheme.